Electric dream: this edgy, astonishing luxo-Brit from the 1970s was the stuff of dreams (and sometimes nightmares). "Demoralize thy neighbour" was the smug headline for Aston Martin's advertising campaign for its stunning Lagonda limousine when it finally hit North America shores in 1982. But it was a tad too late. Not only did the razor-edged Lagonda miss the boat for its largest potential market by nearly six years after its UK introduction, but by then its reputation had been tarnished. 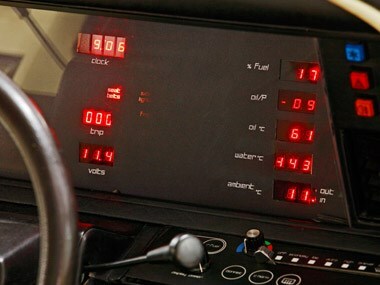 Its costly and complex electronics were subject to such chronic blackouts that Time magazine rated it as one of the 50 worst cars of all time and the cathode-ray tube display dashboard fitted to most second series Stateside cars proved even less reliable than the original model's LED display. 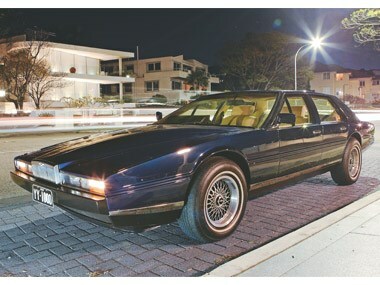 Despite these seemingly unsurmountable obstacles, history records that in many ways, the Aston Martin Lagonda was a qualified success, with around 645 vehicles produced over its 13-year lifespan, during which it consistently ranked as one of the world's most expensive cars. To understand why one of the world's most revered sports car makers went so far out on a limousine limb, it's necessary to absorb a little Aston Martin history. Despite the successful legacy of the DB4, DB5 and DB6 models produced during the David Brown era in the '60s and the relatively good acceptance of the new and larger six cylinder DBS and later DBS V8 introduced in 1967, the company was financially troubled as it entered the 1970s. It was sold in 1972 to a Birmingham-based consortium, then resold while in receivership just two years later to a triumvirate of North American and British businessmen, who saw the urgent need for the company to modernise its production facilities and model range. 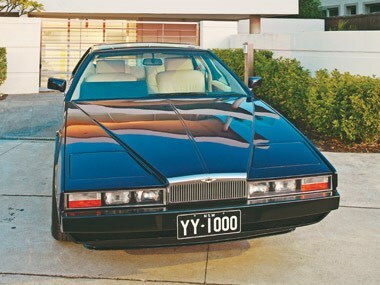 A bold plan was hatched to re-introduce AML's then-dormant Lagonda nameplate on a high-performance and luxurious four-door model with an eye to the oil-rich Arab states and the US market. The AML revival attempt involved giving former Rover designer William Towns a free hand to design a new Lagonda saloon, employing existing mechanicals wrapped in a totally new and spectacular four-door, four-seater body. His first sketches, drawn in February 1976, enthused AML's new owners so much that a green light was given to build a prototype in time for the London Motor Show that October. Drop-jawed show patrons found an extreme interpretation of the classic 1970s 'folded paper' style - a luxury limousine with razor sharp lines that was as long and wide as a Rolls-Royce and sat almost as low as a Porsche 911. Inside its wedgy four-door aluminium-clad body was a gentlemen's club-like leather and timber interior, but the real eye-popper was the car's computerised controls, headlined by its electronic dashboard with 10 small LED displays and touch-sensitive switches. The inspiration for these space-age features was doubtlessly driven by the company's US partner Peter Sprague, who was then chairman of the National Semiconductor Corporation. 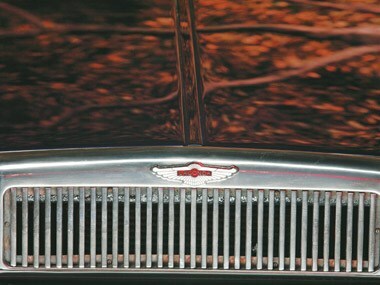 Under the long forward-hinged bonnet was a quad-cam 5.3-litre Aston Martin V8 mated to a three-speed Chrysler TorqueFlite auto transmission. It was a touch of class above the all-too-familiar 1970s formula of a big American V8 in a European box and most were happy to take Aston Martin's promise that this stunning new limousine would whisk them to 230km/h. Opinions on its styling were sharply polarised, but hundreds were sufficiently enamoured to place sizeable deposits that had the combined effect of ensuring Aston Martin's survival and funding the new Lagonda adventure. They were undaunted by the prospect of purchasing what was effectively the world's most expensive four-seater car, with the projected price tag of £150,000 sitting around £25,000 above that of a Rolls-Royce at the time. The challenges involved in producing the most electronically-advanced automobile in the world were severely under-estimated by its tiny ownership group and the launch announcements that production would begin early in 1977 proved nearly 18 months too ambitious. By the time the first hand-made Lagondas were being delivered to customers at the paltry production rate of just one a week in late 1978, sorting out the world's first all-digital dash reportedly had soared to four times the vehicle's entire development budget. Even then, the problems were only beginning and early cars suffered a succession of electronic glitches that saw customers on first-name terms with factory technicians while the computer hardware and software were replaced or upgraded. By 1980 a further change of ownership took place with Briton Victor Gauntlett becoming the company's new executive chairman. Gauntlett was a charismatic leader with a flair for marketing and, after further development and a blaze of publicity when it became the world's fastest four-seater production car, the Lagonda began selling successfully into the Persian Gulf states, where many of them remain today. 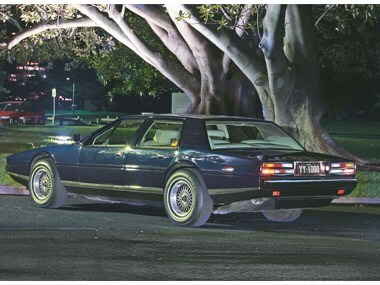 Lagonda production at the Newport Pagnell works had risen to three cars a week by the time the first Series II cars arrived in the US in 1982, but just 24 were earmarked for American customers that year. Amazingly, given all the early problems and the company's underlying financial turmoil, the Aston Martin Lagonda remained in production until 1989. 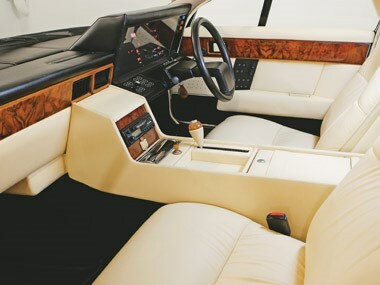 A CRT dashboard was phased in during 1984 and it in turn was replaced by a vacuum fluorescent display, while Series III models introduced in 1987 also featured more rounded styling executed by William Towns. The troublesome pop-up headlights were also replaced to extend the model's appeal to the end of the '80s. As the underground garage door glided skywards in Sydney's Rose Bay and the lights came on, I could not escape a feeling of excitement as the angular, blue outlines of Peter Wise's stunning Aston Martin snapped into focus. Like it or loathe it, the Lagonda is a stunning automobile and now, comfortably insulated from day to day reality by the healing effects of time, must rank as one of the most spectacular and interesting classic vehicles of the 1970s and '80s to own. Although the model had caught his eye when it initially broke cover in the '70s, he had never serious considered owning one until one day he saw this car advertised by York Motors in William Street. Intuitively he knew he had to have it and bought it on the spot in 1994, without driving it or haggling over the asking price of nearly $70,000. To his pleasant surprise, he discovered that he was probably the second owner. As far as he can tell, chassis number 13064 was delivered in July 1981 to a buyer in Kuala Lumpur before making its way to Australia some time later that decade. The car had been on blocks for some years overlooking Sydney Harbour and was a little daggy around the edges, but overall it presented well. Wise got it going, made it roadworthy and lived with its blemishes for 10 years until the temptation to bring it back to its former glory became too much. Concours Sportscar Restorations of Tuggerah, a Jaguar and Aston Martin specialist, had been servicing the Lagonda for some time, so Wise asked proprietor Gavin King to give it a freshen up when some bubbles started to appear on the paintwork. However when the car was stripped, the damage done by years of sea-front exposure was fully revealed and the project developed into a full body restoration. While this was going on, Wise tackled the issue of the troublesome dashboard. When he acquired the car, a lot of its features weren't working and local auto electricians just threw their hands in the air when approached to fix it. So while the body was being restored, he sent the entire dashboard back to Aston Martin in England and was delighted when it came back fully operational. The final decision to be made concerned the all-important colour scheme. Wise felt its original light blue metallic paint and blue leather trim didn't really suit the lines, so Concours repainted it in an original Aston Martin colour of Kentucky Blue, and re-trimmed it using dark blue Wilton carpet and Magnolia Connolly leather. The Lagonda looked stunning when it returned to the road in November 2006 and soon won the outright trophy at the annual Aston Martin Owners' Club Concours. "The Aston Martin owners treat me like a brother, but they're not quite sure if our parents are the same!" quipped Wise. Dropping down into the supremely soft, but not particularly supportive seats, you feel the Lagonda shrink-wrap around you, as its large external dimensions devolve into a cosy, strictly four-seater personal limousine. The small, hide-bound 14-inch diameter single spoke steering wheel sits ahead of a huge black hooded binnacle under which a series of seemingly randomly-placed and very small red LEDs wink at the driver. As you'd expect from everything you've read, convention has been snubbed comprehensively in many areas. For example, the rear windows and the glass 'moon roof' are fixed and do not open, but not for any apparent reason. The plethora of door-mounted controls for the electronic seats are unbelievably complicated, while under the large bonnet near the firewall you'll find the car's ultimate anachronism. Apparently a reliable digital odometer eluded the development team, so a mechanical one is fitted in the engine compartment, leaving only an electronic trip meter inside. On Peter Wise's car it reads just 17,440 miles, which he believes to be genuine, with the last 3000 in his hands. 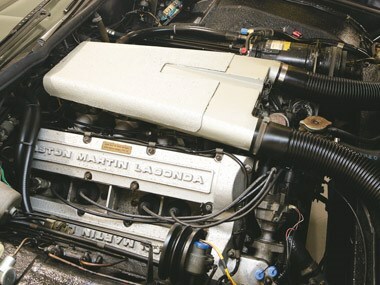 Also under the bonnet you'll find the name of one of the four AML engineers responsible for building the Lagonda's engine. Bill Matthews staked his claim to Peter Wise's V8 (number 64) in 1981. So just how does it perform? Well, you'll need to ask someone else. Wise reckons he's only filled the car's tank around 10 times in his 14 years of ownership and most of that has been consumed tootling around Sydney. With the Lagonda struggling to better 30 litres/100km in traffic, that doesn't translate to all that far, however he rates the Lagonda highly as an enjoyable and sporting drive. "It's a sports car wrapped up in a luxurious saloon body," he said, and it certainly gets a lot of attention. "When you're out driving someone inevitably pulls alongside to ask 'What is it?' When you ask them to guess, the occasional idiot says 'Chevrolet' or 'Lincoln', but that doesn't matter. I love it and I'll never sell it." But while the Lagonda is destined to become a Wise family heirloom, there's one catch. "When I'm not on this planet, the kids aren't allowed to sell it," he said. "I don't want anyone to know how much I've lost on it!" Perhaps most of the other surviving Lagondas will go the same way, being driven less, but admired even more, with their stunning but controversial styling making them the automotive equivalent of a Picasso or a Kandinsky.